We are having a marvelous time. Relaxing, fun, romantic, delicious. Last night the ship took us out to the ancient ruins at Ephesus and there was a lovely concert (classical) under the moon with the ruins all lit up. White tablecloths and white drapes on the chairs, catered with wine, water, olives, crudites and nuts. Can’t tell you how beautiful and serene it all was. Today we were supposed to anchor outside Chios, Greece, but it was too rough for the tender to ferry people back and forth so they took us to Cesme, Turkey, instead, where we could dock. 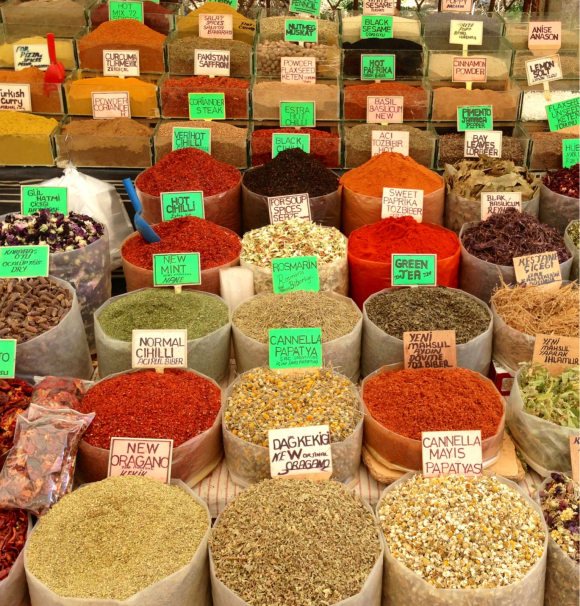 We strolled around and found ourselves downtown in a wonderful outdoor market. The vegetable stalls were breathtaking. 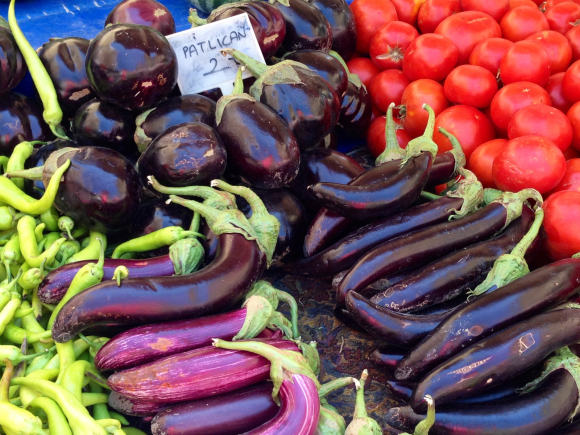 The Turks eat a lot of eggplants, tomatoes and peppers, and here they all were, grown within a few miles. 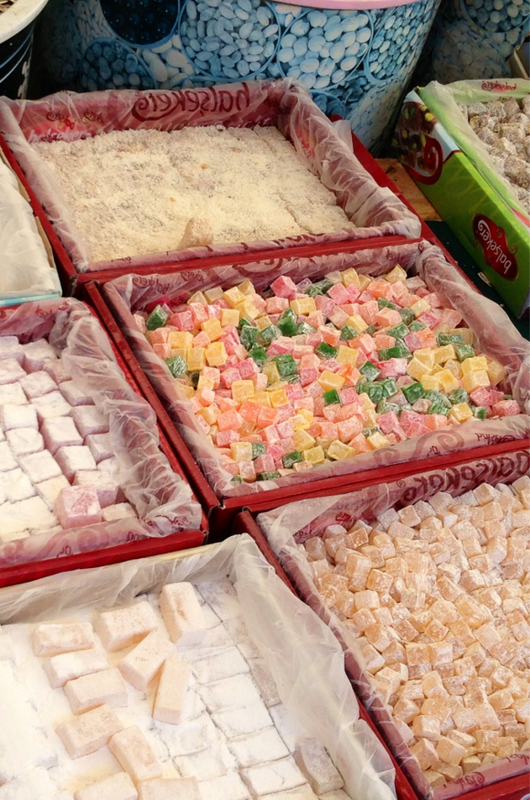 And nuts, and dried fruits, and spices — exotic, familiar, and enticing, all at once. We bought walnuts, dried apricots, and four of the most beautiful ripe peaches I have ever seen. For lunch we stopped at a teensy restaurant with a couple of tables on the sidewalk and exactly zero English in the menu or on the tongue of the owner. Zip. 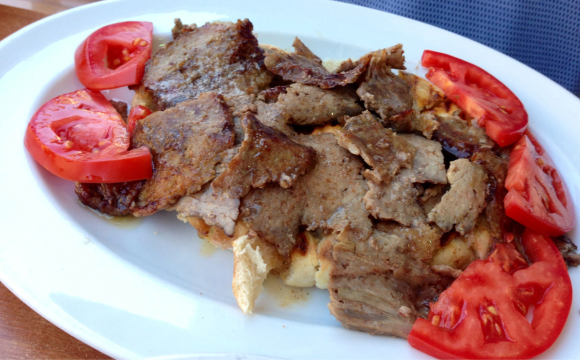 We pantomimed our way into a plate of gyros meat on buttery, chewy pide (flatbread) for Jer, with the best tomatoes I have eaten in years, and a side of vegetable stew that was lovely, but meaty. 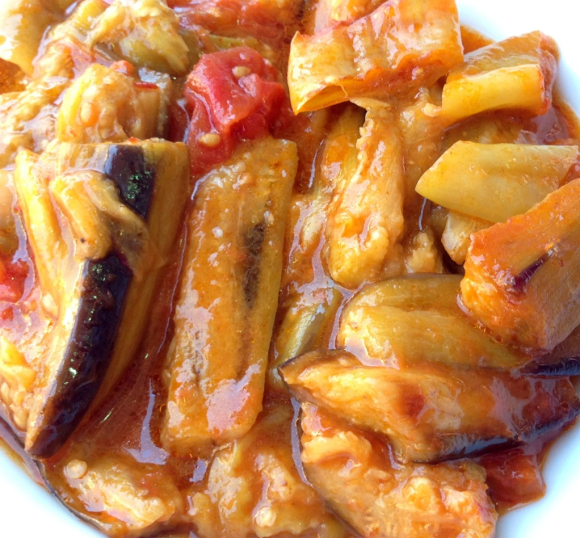 I had a bowl of eggplant braised in tomato sauce and about a pint of really nice olive oil, with rice. There was a crock of urfa-like pepper on the table, smokey, hot and fruity at the same time that gave just the right kick. It was great. Really, seriously great. Headed back to the ship where we found a bunch of balloons on the bed, with a nice bottle of wine and a birthday card for Jer. We ate one of the peaches, holding it over the sink to catch the juice. It was heaven, with a pit. Then we went and jumped in the pool to get rid of the stickiness of the day. Tonight we are eating in on our balcony, and tomorrow is a sea day so just sailing and eating and relaxing. I am getting so used to this. Next Post If it’s Tuesday it must be Sicily.